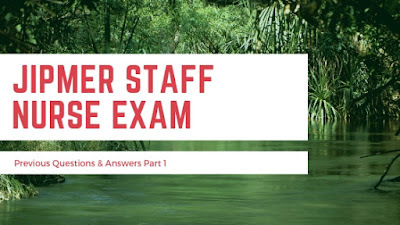 These Questions are asked on JIPMER Puducherry staff nurse exam in 2013, here is first 25 nursing questions and answers are included. 1. When helping a stroke patient, the nurse should assist? 2. To avoid pulling the urinary catheter nurse should tape the catheter on the patient? 3. 16-year old primigravid patient admitted with severe pregnancy-induced hypertension is given intravenous magnesium sulfate. The nurse should obtain which one of the following information? 4. Which one of the following nursing measures would be most appropriate in the care of the patient who has acute epistaxis? 5. Which of the following actions would a nurse take first when caring for a patient experiencing a cardiac arrest? 6. When caring for a patient who has intermittent claudication, the nurse advises the patient to? 7. Lethargic patient has fever, vomiting, headache and the nurse has to prepare him for which one of the following procedure? 8. An active male patient who weighs 180 lb (81.65 kg) has undergone dietary instruction, the patient reports that his current diet consists of 60 kg of fat, 200 mg of cholesterol, and 5 g of sodium per day. What a nurse advises the patient to do? 9. A 55-year-old male patient who is diagnosed with an evolving myocardial infarction (MI) insists on going home. The nurse encourages the patient to be admitted because the greatest risk within the first 24 hours of sustaining an MI is? 10. Which nursing diagnosis is most appropriate for a patient with chronic venous insufficiency? 11.Benefits of breastfeeding include all except? 12.Which condition places a patient with cardiac illness at increased risk of sudden death? 13. A nurse working in an ICU must be aware of the ratio of chest compression to ventilation in CPR procedure is? 14. How long should a nurse wait after taking cold milk for recording oral temperature? 15. The maternal death rate is expressed death per? 16. Which type of solution causes water to shift from cells to plasma? 17. Bleeding time is prolonged in all the following except? 18. How much oxygen a nurse should give to a patient with chronic respiratory failure? 19. All the factors aid in venous return to the heart except? 20. All the following enzymes are secreted by the gastrointestinal system except? 21. While recording intake-output nurse has to consider insensible water loss from the human body and the normal is? 22. The nurse is caring for several mother-baby couplets, In planning the care for each of the couplets, which mother would the nurse expect to have, the most severe after birth pains? 23. Assuming the menstrual cycle length as 32 days and LMP as June 10th, Which of the following is most likely due date? 24. 30 year old female complained of wetting her dress while coughing, which one of the following conditions a nurse should suspect? 25. Which one of the following is not a described type of female bony pelvis?